Why Does My Digital Scale Fluctuate? Inaccurate readings are common for scales of all kinds if calibrated incorrectly. Every time a digital scale is moved, you need to calibrate it again to ensure accurate readings. By doing this, you reset the scale’s internal parts and allow it to find the correct “zero” weight readings. Most digital scales have manual functions where you can press one or a combination of buttons to reset the scale’s internal electronics. For battery-operated models, you can also reset the scale by removing the batteries. Different activities you perform affect your body’s water retention, which in turn also affects its bodily composition. For example, you will notice that your weight is the lightest early in the morning when you wake up. Why? It’s because your body is void of food and water. So the next day, if you measure your weight after you consumed your first meal, the result would probably be higher. Water retention is also the main culprit why your weight can fluctuate during strength training. That is because when you cause trauma to your muscles, they retain water in order to rebuild themselves and speed up the recovery process. Intuitively, your body has a system that creates a balance between your sodium and water levels. Consuming more salt will just make your body retain more water leading to higher readings. Like sodium, sugar intake can also affect your body weight as high levels of insulin in the body also promote sodium and water retention. This gain or loss in weight is usually temporary and not your actual weight. Again, this is related to your body gaining water weight. An example would be the menstrual cycle for females. During this time, estrogen levels are very high, and the body responds by retaining more fluid. Not getting enough sleep is also one factor that can raise your body’s cortisol level (stress hormone), increasing your appetite in the process. Since digital scales usually operate with the help of batteries, reading fluctuations may also result from problems within the batteries. Like when the voltage gets too low, the scales can either produce low-quality readings, can blink on and off while in use, or stop functioning altogether. Improper placement of your digital scale can also contribute to inaccurate readings. Temperature fluctuations, uneven surfaces as well as nearby electronics can affect its performance. Examples are placing your digital scale near high voltage lights or high magnetic fields such as a radio or a microwave. Thus, your digital scale should be placed on a hard, even surface. Placing it on soft surfaces, like a carpet, will provide inaccurate results. Rough handling of digital scales can also damage sensitive electronic parts and load cell. How Can You Check if Your Scale is Broken? Calibrate the scale by manually resetting the device according to the user’s manual. In most cases, inaccurate readings are resolved after proper calibration. If after calibrating the reading is still off, you can check it further by testing it using an object with a known weight. Set it on the scale and keenly check if the result will be higher or lower. Weigh the same item multiple times. Also, try weighing other objects all with a known weight and see if the scale produces the same results. See if your scale is sitting on a level surface. Check under the unit and make sure that all feet or corners are even and in contact with the surface. Regularly cleaning the bottom of the scale will also prevent debris from accumulating and affecting the way it sits. If batteries operate your digital scale, replace the batteries, calibrate the scale and weigh again. Also, check the battery terminals for any damages and make sure that the batteries are placed correctly. For units that are plugged in, check the wiring if it’s plugged in properly. 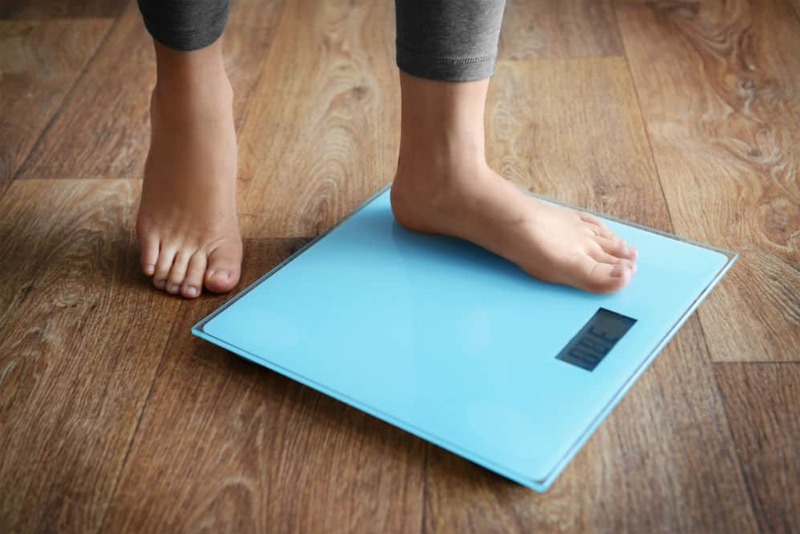 How Can You Take Care of Your Weighing Scale? Digital scales are electronic devices that should be handled with extreme care if you want it to provide precise measurements. Some digital scales are used in bathrooms; however, this does not mean that it’s waterproof. So, keep in mind that you should not expose it to moisture. Using a damp cloth to clean your scale will do. If you have touch-sensitive scales, don’t press too hard on the controls. Most importantly, don’t tamper with your digital scale. It will void the warranty and will likely damage the device. Digital scales are useful not only for work purposes but also at home. If you’re on a diet and you see your digital scale fluctuate the first time, don’t get discouraged easily and assume the worst. Keep an eye on the next readings while also keeping your diet in check to be certain that you’re not getting the wrong information. However, this can only be true if you make sure that your device is working correctly. Test your scale regularly to ensure that the results are accurate and reliable. Taking care of your digital scale is also essential. After all, it’s still an electronic device with components inside it that are expectedly sensitive to movement and handling.